Caddie Woodlawn by Carol Ryrie Brink. Macmillan, 1935. Currently available. Face Value: There are hundreds of variations on the Caddie Woodlawn cover out there, but I am particularly fond of the cover on my copy. Caddie is joyously skating on a frozen pond, her glorious red hair flying loose behind her. She looks independent and strong and like someone who I would want to be my friend. Does it break the slate? Tough call. Caddie is, apart from her surroundings, a Slatebreaking individual. She challenges gender norms and refuses to be boxed in by the expectations of her friends and family. However, this book makes so many grievous offenses regarding ethnicity and cultural bias that it destroys its Slatebreaking credentials. Who would we give it to? No one, actually. More on that later. Review: What happens when you revisit a beloved book from your childhood and realize that it is goes against your adult ideologies and values? I had this alarming experience when I re-read Caddie Woodlawn for Frontier Week here at Slatebreakers. I remembered Caddie as a bold, inspiring Wisconsin girl. I was utterly dismayed to read this book again in 2012 and experience discomfort, frustration, and even disgust at the attitude toward the Native American of Northwest Wisconsin that is very apparent throughout the book. Author Carol Ryrie Brink based the fictional Caddie Woodlawn upon a real Caddie Woodlawn, Brink’s grandmother. The book is inspired by Woodlawn’s tales of her childhood in Wisconsin. The Woodlawn family resides in Dunnville, a tiny town. Caddie is the Woodlawn sibling who tends to hang with her brothers and engage in the wild and energetic pursuits typical of young boys. Mama Woodlawn is upset that Caddie does not act like a “civilized young lady,” but Caddie’s father encourages her independence and continues to allow her to hang out with the boys. Her good-natured attitude is admirable throughout the book. Although she may feel self-conscious at times when her mother and sisters repeatedly criticize her active and unrestricted lifestyle, she always bounces back and makes her own decisions. This attitude worsens when Caddie sees that the mixed-race children at her school (the book uses the cringingly awful term “half breed”) are upset because their mother left home, she decides that she is going to help them. How will she help them? By spending money on them, of course! Caddie takes her previous saved up silver dollar and spends it on candy, combs, and handkerchiefs for these children. And of course these trinkets make the children so happy that the sad thoughts of their mother’s departure are completely wiped away! Yeah, right, Caddie. Your penny candy fixed all of their problems. The “white savior” theme is especially prevalent in this portion of the story, and I couldn’t stomach it. In fact, I felt very upset over the fact that I thought this was such a moving story as a child. Here’s the thing about Caddie Woodlawn: it captures the spirit of a certain time and place within U.S. American history. It is written in an engaging style that is appealing to young readers. However, I feel strongly that this book should not be glibly read for fun without any additional conversation or “troubling” by parents, teachers, librarians, and other reading companions. Kids reading Caddie Woodlawn should think critically about the attitudes of the Woodlawn family and their fellow settlers. Why are those attitudes problematic? In what ways do those attitudes persist in our contemporary culture? I said before that I would not recommend Caddie Woodlawn to anyone, which may be a bit harsh. But I know that there are other books out there that explore a similar time and place within history and can present a more balanced view of the interaction between settlers and Native Americans. Readers, I would love to read your responses, as I am still deeply conflicted about this book. 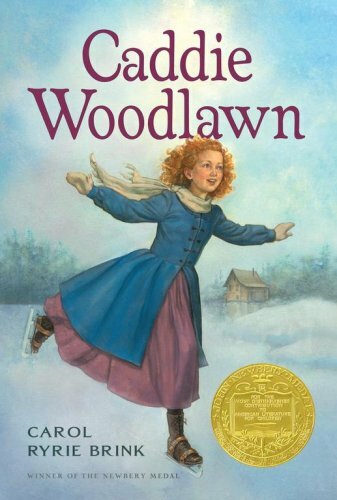 What would you do if your student or child were reading Caddie Woodlawn independently? Is it your responsibility as an adult in that child’s reading life to intervene and have a conversation, or do you let the kid puzzle our their own perception of the book? Is there a point when we become overly sensitive and start censoring the past? Should that be avoided? Chime in. I want to know what you think. Reviewed from a copy from the Wisconsin Historical Museum. This entry was posted in Middle Grade, Reviews, Theme Week and tagged Caddie Woodlawn, Frontier Week, native americans, problematic literature, Racism, Wisconsin. Bookmark the permalink. I encourage you to take a look at the recent musical adaptation. In it the authors have made the effort to update the attitude towards the Native people. They are Dakotas, they speak their own language, they certainly aren’t helpless or less than human. I think the modern adapters have done a wonderful job addressing the very issues that trouble you about the original work. This is an excellent suggestion. Thank you. I am going to look up the soundtrack right away. I really appreciate it when theatre artists take a critical look at the texts they are adapting. Tim Minchin and Dennis Kelly did an excellent job with their adaptation of Roald Dahl’s Matilda this year, too. I think if you do share it with children, make sure to have conversations about it, especially if they’re younger and not yet critically thinking. Geena Davis talks about how she would point out gender inequalities in children’s shows to her kids, until they started being able to do it on their own, and that kind of questioning mode came naturally to them. But it is a difficult line–if a book is extremely racist/sexist/homophobic, how much do you excuse because of the time or place of the author/book and because the writing is good, or do you just say no, the literary merits don’t make up for all that horrible stuff. Like Oliver Twist–originally there were I think over 600 instances where Fagin is referred to as Jew (and generally not just “the Jew”, but “the dirty Jew, the conniving Jew, the menacing Jew” etc). A Jewish couple that Dickens became acquainted with brought up how troublesome it was to them and how it had hurt them; and it later editions he edited his anti-Semitic descriptions of Fagin by a good half or so. So anyway, I get a Barnes & Noble edition of the book to read for the first time, they talk about this in the intro, and then say they’ve now added back in all those descriptions. And frankly, I couldn’t stomach it. I had to quit about a third of the way through I found it so offensive. I get the talk of censorship and bowdlerization, especially in cases like Huck Finn where they replaced the n-word with slave…but in a case where the author himself edited offensive passages because he realized he was wrong, I think that should stand. It’s different from someone else coming along years and years later and “censoring” it, when you don’t know if the author would have ever done so themselves. So anyway, getting back to the actual book in question, I personally didn’t think the positives of Caddie Woodlawn outweighed the negatives, so it’s not one I would read again or give out. Which is sad, because it could have been a really good book otherwise. How does your reaction to Caddie Woodlawn stack up to the ways the Indians are treated in the LIttle House series? This review makes me think I’ll skip re-reading Caddie Woodlawn any time soon……I have to say, I was enjoying reading the Betsy-Tacy series, although I started getting uncomfortable figuring out how to talk with my daughter about the racism towards the Gypsies in the one where they go over the big hill. And then the later book in the series, where there are two incidents of blackface (one planned but not carried out by the girls, and another in a theatre) made me just put it aside entirely. I guess I cannot really compare my reaction, because the only Little House book I have re-read since childhood is Little House in the Big Woods, during which the Ingalls family doesn’t interact with any native peoples. I’m sure I will have some discomfort while re-reading the rest of that series, too. I had no idea about Betsy-Tacy. Again, that sounds like one of those instances where the racism just didn’t register for me as a child reader, and that upsets me a little. Well, with the blackface in “Betsy~Tacy Go Downtown”, it is historically relevant. They go to see “Uncle Tom’s Cabin”, and in 1904, that means blackface. It’s never brought up again in any other book, and Maud Hart Lovelace became a civil rights activist in later life (actually, she was at the time the book was written). I think at that point, you’re censoring history – you can have a really valuable discussion with your daughter about how people used to do that before realizing how hurtful and wrong it was. Since they were still talking about “Uncle Tom’s Cabin” having struck “the death knell of slavery” (taken from the poster in the book), they were being thoughtlessly racist when they thought they were being compassionate, which is definitely a good discussion. For the Syrians (not Gypsies), in “Betsy~Tacy Go Over the Big Hill”, the entire story is about overcoming racism. They had bad impressions of “The Other”, only to find out that they were entirely wrong, and “The Other” are in fact delightful people just like them who are incredibly proud to be Americans. Tib is the only one with the hard-headed sense to point out that if Bushara chased Sam with a knife, Sam probably deserved it, since he was a bully. She is also the first to charge in when she sees Naifi getting picked on, and is praised by her mother not for assuming the “white man’s burden” in protecting someone of color, but for protecting a fellow immigrant (“Both Tib’s grandfather’s come from the old country. I’m proud of her”). A later book, “Emily of Deep Valley”, concerns a character who was inspired by Jane Addams work at Hull House to start a Boy’s Club for the Syrian children to meet and play with American children and begin an English/citizenship class for their mothers, despite some efforts by local racists. A later book, “Emily of Deep Valley”, concerns a character who was inspired by Jane Addams work at Hull House to start a Boy’s Club for the Syrian children to meet and play with American children and begin an English/citizenship class for their mothers, despite some efforts by local racists. I’d say definitely give the series another chance.